In his fourth post in the series, Marshall Kirkpatrick focuses on the intersection between artificial intelligence and Mobile, and in the fifth he focuses on cloud. By way of reminder, Marshall launched a 30 day series that explores the intersection between AI and the various innovation components on my emerging futures visual. IDC predicts that the scale-up of digital business strategies will drive more than half of enterprise IT spending within the next 24 months, rising to 60% by 2020. Mastery of 3rd Platform technologies will be table stakes for successfully executing DX business initiatives and “Cloud First” will become the new mantra for enterprise IT. Virtually none of the other 3rd Platform technologies or major DX initiatives is possible in scaled-up implementations without the Cloud as the foundation. By 2020, IDC predicts that enterprise spending on cloud services, the hardware and software to support cloud services, and the services for implementing and managing cloud services will exceed $500 billion, more than three times what it is today. This Presentation tells the full business evolution story articulated below. 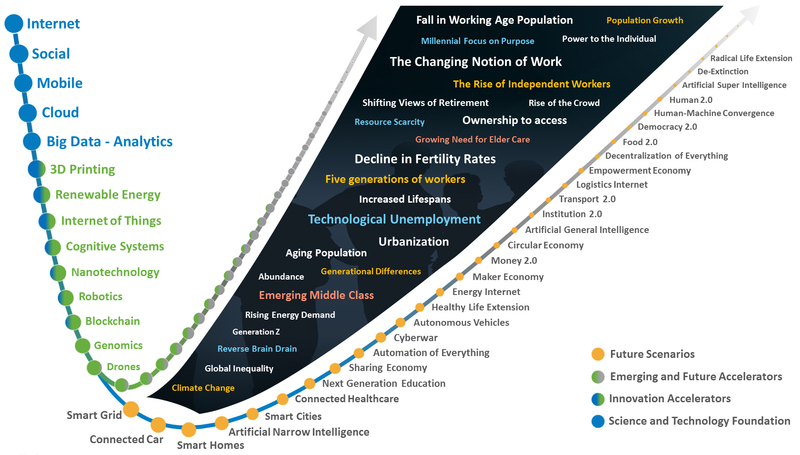 Several key drivers have positioned the next two decades to deliver a staggering – perhaps unprecedented – amount of change. The accelerating pace of business, the growing impact of digital, and several other major indicators suggest that a next generation enterprise is on the horizon. The first of these indicators is the level of societal change impacting everything from business to war. In the business world, the implications of this change can be seen in our employees, where for the first time in history, four generations of workers are in our work force. The associated challenges are coming into focus, as some of these workers are digital natives, but the vast majorities are digital immigrants. With customers, the shift of power to the individual has changed their role forever and placed them at the center of the company ecosystem. Other indicators include an intense focus on growth, which increasingly requires collaboration within and outside the four walls of the Enterprise. This growth agenda drives a new type of value ecosystem, enabling growth that in many cases is outside a company’s traditional business. In my recently concluded transformation series, I identified Systems of Engagement as a key enabler of the future enterprise. A recent Survey conducted by Forrester suggests that systems of engagement will soon rearrange the landscape of IT organizations, technologies, architectures, budgeting, funding, and governance. It is not surprising that in this age of the customer, systems of engagement are finally getting attention – but as the survey reports, they require more than organizations are prepared to deliver. This list of 99 Facts pulled together by SAP continues to build the case for inevitable change. The title of this SAP presentation is “The Future of Business”. Here are some of the key facts from various sources. There are embedded links in the content that take you to the source documents. Enjoy. This current executive presentation captures the breadth of the digital enterprise transformation series. It can be found on SlideShare – appropriately titled Blurring the Boundaries. The presentation is a call to action for leaders everywhere. A slide in the deck asks the question: as status quo thinking prevails, what drives action? The first half of the presentation builds the case for action. The second half describes a framework to enable that action. Over the last three months, I have presented a framework for thinking about transforming the enterprise to the type of enterprise that can succeed in the year 2020 – What I call a digital enterprise. Throughout this multi-part transformation series, I have focused on those forcing functions that push us to transform – the drivers that stir us to action. Old models that were created for another time cannot lead us into this future – we must think differently. We must invent the models that define business in the decades ahead. So, I wrap up this closer look at transformation with the hope that I’ve convinced you in some small way that we are indeed heading towards what is likely to be the most transformative period in history. My hope is that leaders everywhere think differently to usher in a period of prosperity and societal advancement. Instead of talk of disruption, let us talk of enablement and advancement. May we each have the wisdom, vision and courage to lead in this emerging transformative period. For a review of this entire transformation series, here is an intro and link to each of the prior posts. As a reminder, forcing functions are those things that force the enterprise to invest in a future state. The enablers are those facilitators of change that allow us to address the forcing functions and build a path towards the future. Click on the underlined title to access each post.